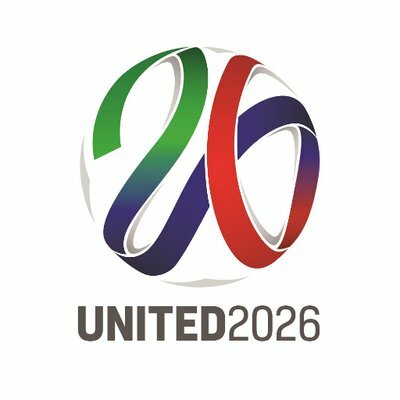 The 2026 tournament will be the biggest World Cup ever held - with 48 teams (instead of the current 32) playing 80 matches over 34 days. A BBC Panorama documentary claimed Qatar spent £117m on their successful bid for the 2022 World Cup - the first to be held in winter - while former Fifa president Sepp Blatter suggested there was an agreement in place for Russia to host the 2018 tournament before the vote took place. As a result Fifa - under the presidency of Gianni Infantino - promised a "more open and transparent" vote to decide the 2026 World Cup host. The 'United' World Cup will generate $14bn (£10.3bn) in revenue and make an $11bn (£8.1bn) profit for Fifa, says Cordeiro. 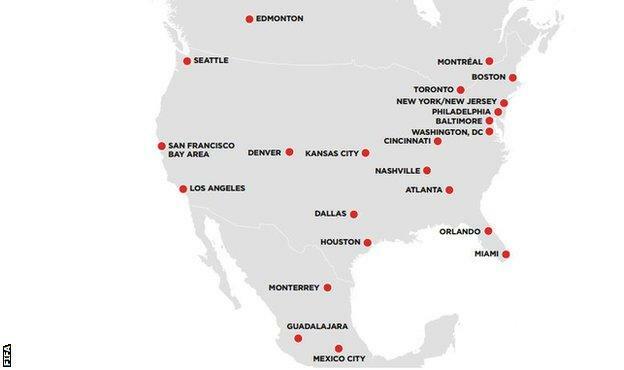 The distance between the most northern host city (Edmonton) and the most southern (Mexico City) is almost 3,000 miles, which compares to 1,900 miles at this month's tournament in Russia. The 1994 World Cup, staged by the US, had the highest average attendance in the tournament's history, while Mexico was the first nation to host the event twice. 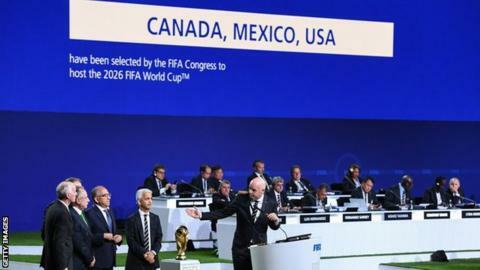 However, Fifa president Gianni Infantino said the issue of all three hosts - Canada, USA and Mexico - being given automatic slots is still to be decided, with discussions set to take place in the next few weeks. US Soccer president Carlos Cordeiro: "Hosting the 2026 Fifa World Cup is a rare and important moment to demonstrate that we are all truly united through sport. "We are humbled by the trust our colleagues in the Fifa family have put in our bid, strengthened by the unity between our three countries and the Concacaf region and excited by the opportunity we have to put football on a new and sustainable path for generations to come." Morocco Football Federation president Fouzi Lekjaa: "I wish to congratulate Fifa for the conduct of this process and congratulate the president for what he has done in order to move things towards more transparency and more inclusion. "I would like to reaffirm the determination of my country to continue to work for football and realise one day our dream to host the World Cup in Morocco." The Football Association (FA): "We congratulate the USA, Canada and Mexico on winning the bid to host the 2026 Fifa World Cup. Both bids were of a very high quality and we welcome the fact that the bidding process was both open and transparent. "We cast our vote for the 'United' bid as we believe the independent technical assessment made its advantages very clear. However, it is important to note that both bids were deemed to have met the hosting requirements and a tournament in Morocco, close to Europe and in a country that loves football, had a great deal for English football fans to be excited about." Five times they have bid, and five times they have been overlooked - Morocco are perhaps destined to never host a World Cup. Morocco's bid faced unwanted attention when Fifa secretary general Fatma Samoura was the subject of an investigation into an alleged conflict of interest. Members of Fifa's World Cup bid evaluation task force said she had an undeclared family link with Morocco 2026 bid ambassador El Hadji Diouf. She was cleared of any wrongdoing and dismissed the claims as "laughable" and "unfortunate". Nine of the 14 stadiums included in Morocco's bid were yet to be built, while the remaining five required "significant renovation or upgrading".